•Net financial debt decreased to €965.2 million at the end of December 2017 (compared with €977.9 million at the end of December 2016). The Board of Directors, meeting on 22 February, approved the consolidated financial statements for the year ended December 2017. The accounts were subject to a limited review by the Statutory Auditors. The Group's consolidated turnover for the six-month period ended December 2017 amounted to €1,066.4 million, compared with €1,077.8 million from 1 July 2016 to 31 December 2016. The fall of 1.1% was due to the exit from consolidation scope of the Etang de Berre and Sévigné clinics in 2016, the Herbert clinic in 2017, and despite the entry of the Private Hospital of East Lyonnais in 2017. On a like-for-like basis, turnover nevertheless increased by 0.1%, despite one fewer business day. With regard to the public service tasks managed by the group, the number of emergencies increased strongly, up 6.5% over the past year with 280,000 cases registered by the emergency services of our facilities. EBITDA for the half-year was €103.7 million, down 11.7% on a reported basis. At constant scope and accounting methods, EBITDA was down 9.2% over the period. The EBITDA margin, as a percentage of turnover, decreased from 10.9% to 9.7%. Current operating profit for the period 1 July 2017 to 31 December 2017 was €37.2 million (or 3.5% of turnover), down 25.9% from the €50.2 million recorded for the period 1 July 2016 to 31 December 2016. The other non-current income and expenses resulted in a net expense of €43.7 million for the year ended, consisting almost entirely of restructuring costs. From 1 July 2016 to 31 December 2016, other non-current income and expenses represented a net income of €10.8 million. The cost of net financial debt amounted to €20.2 million for the six months ended 31 December 2017, compared with €20.5 million the previous year. This consists primarily of interest on senior debt. 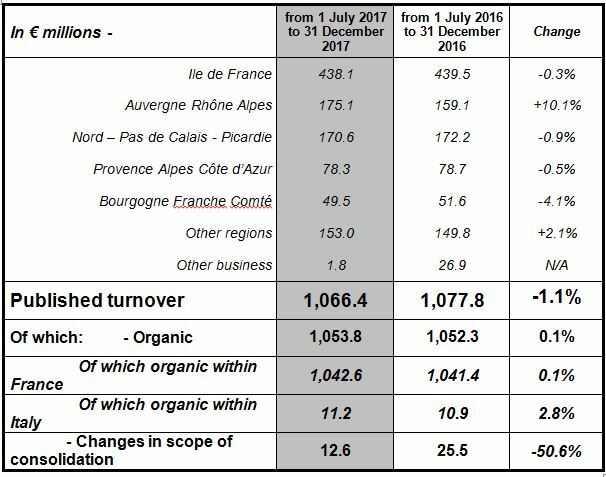 In total, the Ramsay Générale de Santé Group recorded a net loss of €22.1 million at the end of December 2017, compared with a profit of €24.7 million for the period from 1 July 2016 to 31 December 2016. Net financial debt at 31 December 2017 decreased to €965.2 million compared to €977.9 million at 31 December 2016. This debt includes, in particular, €1,099.7 million in non-current borrowings and financial debt, €91.3 million in current financial debt and €180.3 million in cash. Ramsay Générale de Santé SA is listed on the Eurolist of Euronext Paris and is included in the Midcac index. Ramsay Générale de Santé is the leading Group in the private healthcare sector in France with 23,000 employees in 121 private clinics. The Group works with 6,000 practitioners, forming the leading independent medical community in France. A major player in hospitalisation, Ramsay Générale de Santé provides a comprehensive range of patient care services in three business segments: Medicine-Surgery-Obstetrics, sub-acute care and rehabilitation, and mental health. Ramsay Générale de Santé has developed a unique healthcare service, built around the quality and security of patient care and organisational efficiency. The Group takes a comprehensive approach to patient care, including personalised assistance and support before, during and after hospitalisation. Générale de Santé also participates in public service missions in its sector and helps to strengthen France’s mainland healthcare network.